Does sudden spoiling affect creatures with buffs? 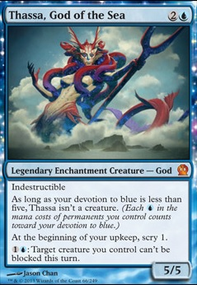 I'm suggesting the other Squee in case you need more creature recursion which is strong in this deck. You only have about 5 recursion cards so if you want to be able to sac more non-tokens I would consider putting in more. It's basically a worse version than the Squee you already have, but it's recursion nonetheless. I agree that the attack pump spells aren't worth it. Especially Overwhelming Stampede since your tokens aren't high power. I would rather focus on spells that have ETB effects like you have with Impact Tremors to aid the token storm. You could upgrade to Purphoros, God of the Forge if you can spend the money. The only pump spell I would consider is Chorus of Might which could be a commander damage win condition. Keep whatever ramp you have and add more if you want. your colors have access to all kinds of great ramp spells like Cultivate , Rampant Growth etc which will get you the proper color fixing. Ramp is beneficial in any situation, so I think's it's definitely worth a look. Your artifact ramp seems appropriate. Those two goblin cards really depend on how consistently you can generate goblins. If you can get goblins you're willing to sac out early every game, then I think at least Goblin Grenade should be kept. Definitely keep Pawn of Ulamog , he gives you free ramp for doing what the deck is supposed to be doing. The other two can probably go. Also you have 2 Hull Breach in there. 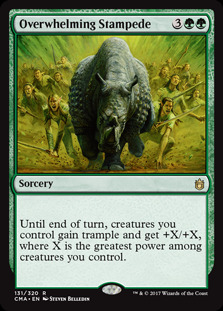 You could possibly replace Overrun or Overwhelming Stampede with Craterhoof and Triumph since they’re strictly better unless you just want redundancy in your trampling. Precinct Captain and Geist-Honored Monk aren’t our best token producers and could probably be swapped out for the doublers. I’m in the middle of cutting some things for cards in the Maybeboard. I’ve already cut Lifecrafter's Bestiary and Oketra's Monument since this deck doesn’t rely on playing tons of creature cards. There’s only about 20 creatures which is pretty low for a green deck. In that light you might also cut Prowling Serpopard depending on how much counter magic you run into. Ajani, Caller of the Pride is the weakest planeswalker and is really only good to burst into cat tokens 4 turns after you play him. You might not miss him if you’re running Craterhoof, and White Sun's Zenith takes care of creating lots of cats. Let me know how it plays once you build it! With you having a critical mass of Elementals, both tokens and actual creature cards, a good finisher such as Overwhelming Stampede would be a good idea, I think. 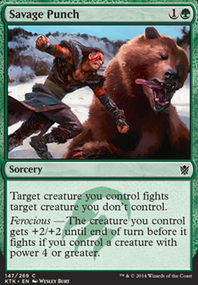 If you don't mind winning through infect, Triumph of the Hordes is also good. It gets bonus points since it gives Omnath infect, so his bolt effect when a creature dies will deal infect damage too. 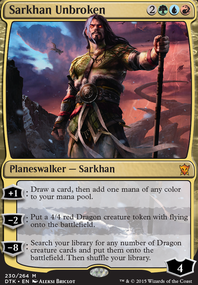 Past that, Warped Landscape and Terminal Moraine are also good land fetches, and you only have four non-colored lands as is, so it won't be a huge color loss. Also, Pyroblast is strictly better than Guttural Response, since it counters any blue spell and can also blast blue permanents. Genesis Wave , Duskwatch Recruiter Flip and Riftsweeper are more synergistic budget cards to play in an Elf deck when against Settle. They won't stop Settle, but they will help to recover from it. 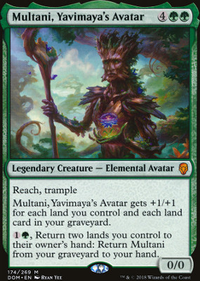 Wave and Recruiter are ways to use the extra mana you will get from lands that you get after a Settle to get more Elves/creatures/permanents. Riftsweeper is an Elf and she can remove a creature who was exiled by Settle from the exile zone and put it back into your library. Eternal Witness and Regrowth are good cards that can recur Overwhelming Stampede so you can cast it again when you have recovered from Settle. Evolutionary Leap and Greater Good are ways to sac your creatures so they will not be exiled. Leap costs one mana per creature to sac and Greater is a free sac, but requires discarding cards after drawing. It's easier to recur Elves when they go to the graveyard rather than being exiled.